Bio: Born and raised in the suburbs of Chicago, Illinois, Jeanne Leemon has lived in the Knoxville, Tennessee area since 1993. 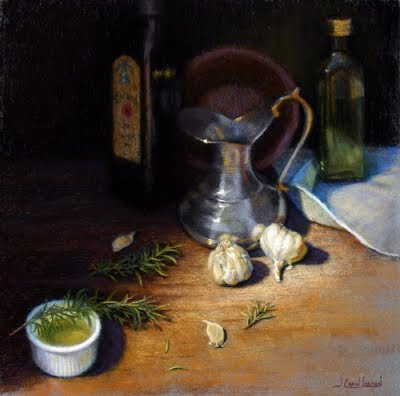 As an artist she is self-taught, and has attained the status of Signature Member of the Pastel Society of America; Jeanne is also a juried member of the Oil Painters of America, the International Guild of Realism, and the Women Painters of the Southeast, and also a member of the Portrait Society of America. Her paintings have been accepted into numerous juried shows throughout the Southeastern United States. She won Honorable Mention twice for her pastel work in the annual Pastel 100 competition of The Pastel Journal in 2009 and 2010. Subjects: Landscape; Still Life; Figurative..
Gallery: Recent Works; Still Life; Figures; Landscapes. Image View: Each gallery consists of thumbnails which indicate title and size, but not medium – you can get that information as a tooltip by resting the cursor on the image. Or by clicking to enlarge. You can then zoom again; the image can be saved. The prize-winning Cipolline Onions is 14.5 x 16 ins; 500 x 495, 185 KB.